Join Kittery, Maine author Terry Farish as she launches her two new “I’m Your Neighbor” books set in New England’s “new arrival” communities. Launch of the picture book, JOSEPH’S BIG RIDE illustrated by Ken Daley. 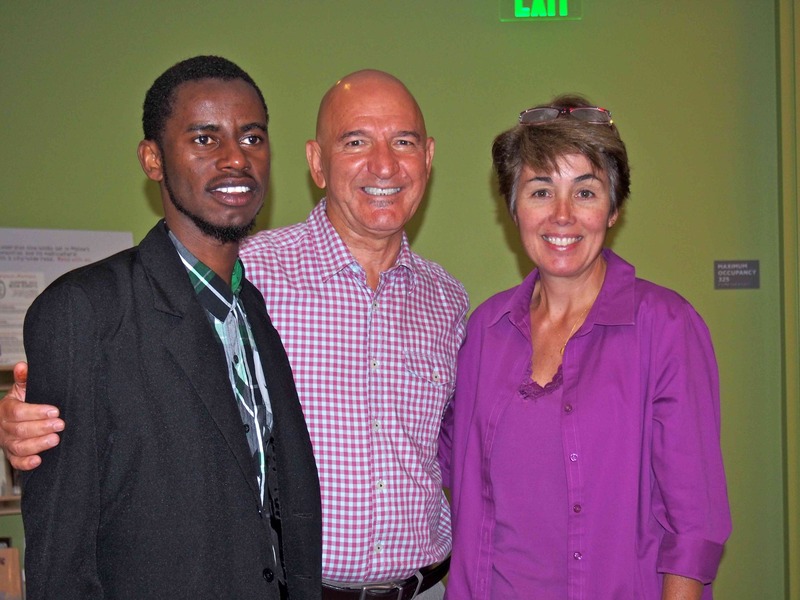 A Sudanese refugee boy’s determination to ride a bicycle leads to an unexpected friendship. This is a School-Wide Family Story Event in a school that serves the newest refugees coming to Concord. Many students are from Sudan, Somalia, Rwanda, Bhutan, and Burma. Launch of LUIS PAINTS THE WORLD in the Dominican-American city that inspired the story. 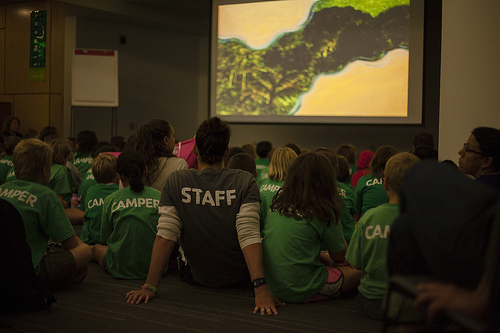 On Thursday, August 8th, families, children and almost one hundred campers from the Portland YMCA summer program gathered in the Rines Auditorium at the Portland Public Library for a celebration of the book A Path of Stars, written and illustrated by Peaks Island author Anne Sibley O’Brien. Project Director Kirsten Cappy briefly explained I’m Your Neighbor, Portland and encouraged the children to find books in the library that were about children from different cultures before inviting O’Brien to the stage. The author first introduced herself and then was joined Sokunthim Nou and her husband, the Cambodian owners of Chiang Mai restaurant, who prepared the Cambodian dish mango sticky rice for a snack that would be eaten later in the event. O’Brien showed a map of Cambodia and explained some Cambodian history to give background to her story. She also explained that her book was inspired by the stories of her friends Vaensa and Peng Kem, who were born in Cambodia and had to leave the country because of the war. The audience sat captivated as O’Brien read A Path of Stars aloud and watched illustrations from the book projected on the screen. After the story-telling, the children watched a video of traditional Khmer dancing before standing up and trying a short dance of their own. O’Brien led the audience in learning the steps and hand movements of the dance and soon the room was filled with sounds of Khmer music as children stepped and flicked their wrists. Once the music ended, the audience prepared for a drawing lesson of the lotus flower. O’Brien showed pictures of the lotus and explained its significance in Cambodian culture. “The lotus flower is a symbol for purity because it roots itself in the mud but blooms on the surface of the water beautifully clean and pure,” she said. The audience gasped when O’Brien showed pictures of the famous temple, Angkor Wat, and a giant statue of the Buddha sitting in the lotus flower. O’Brien led the children in the drawing lesson and drew different examples of a closed and open blossom. Once everyone had learned and practiced drawing the flower, cards with “I’m Your Neighbor” written in Khmer were handed out to everyone in the audience. They could draw and color the lotus on the front and then write their own messages on the inside. While they drew, they snacked on the mango and sticky rice. Before leaving, the children turned in their cards that would be delivered to Chiang Mai restaurant as a thank you for the delicious snack. Some kids wrote that they hoped to visit Cambodia one day or that they thought Cambodia was cool. Others wrote “I’m Your Neighbor” on the inside and signed their name. I’m Your Neighbor Portland is tremendously grateful to the Law Offices of Joe Bornstein, who helped sponsor this event and advertised it on the Time and Temperature building. 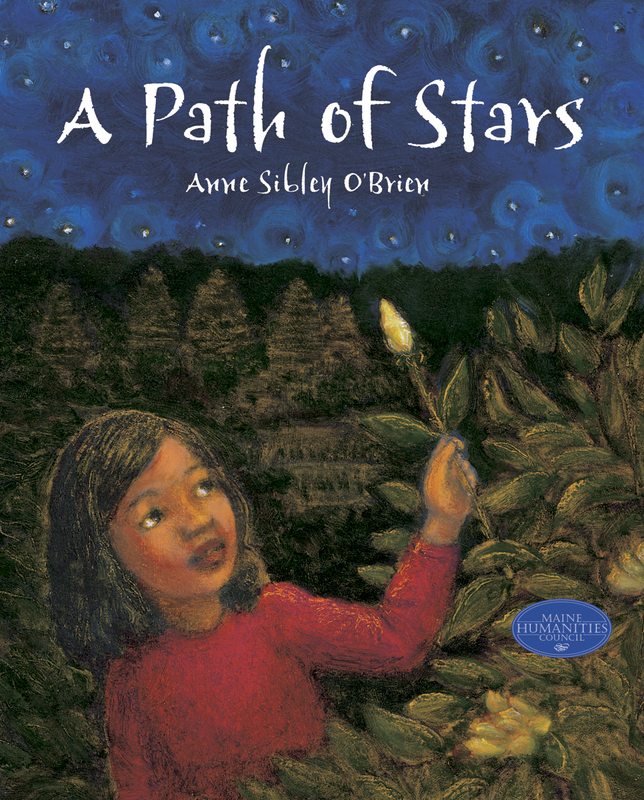 With their generous donation, every child left with personalized copies of A Path Of Stars signed by O’Brien, a set of colored pencils and a lotus blossom drawing activity. We also thank Xpress Copy (located on Fore Street in Portland, ME) for donating cardboard mats that the children used while drawing and the YMCA for bringing their campers to the library! Last Friday, August 2nd, I’m Your Neighbor Portland hosted its largest event yet, “Ramadan Mubarak: A Holiday Celebration and Education for Families of All Faiths.” Over two hundred people attended throughout the evening, including members from the Muslim community, Portland residents and those passing through on their First Friday Art Walk circuit. Attendees could have their names written in Arabic when they first entered. The Portland Library had a display of their collection on Islam next to the I’m Your Neighbor Portland bookshelf, and PPL staff were on hand for anyone who wanted to check out books. 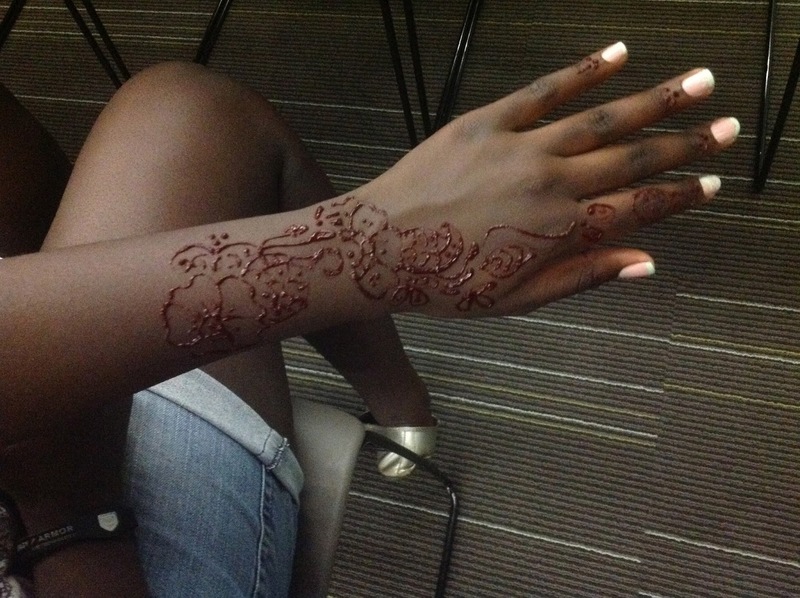 The henna station was extremely popular and volunteers were kept busy as a constant stream of people were lined up waiting to have their hands painted with beautiful designs. Peaks Island author and illustrator Anne Sibley O’Brien had her art work from Moon Watchers on display to show the process of her research and early sketches for the illustrations. 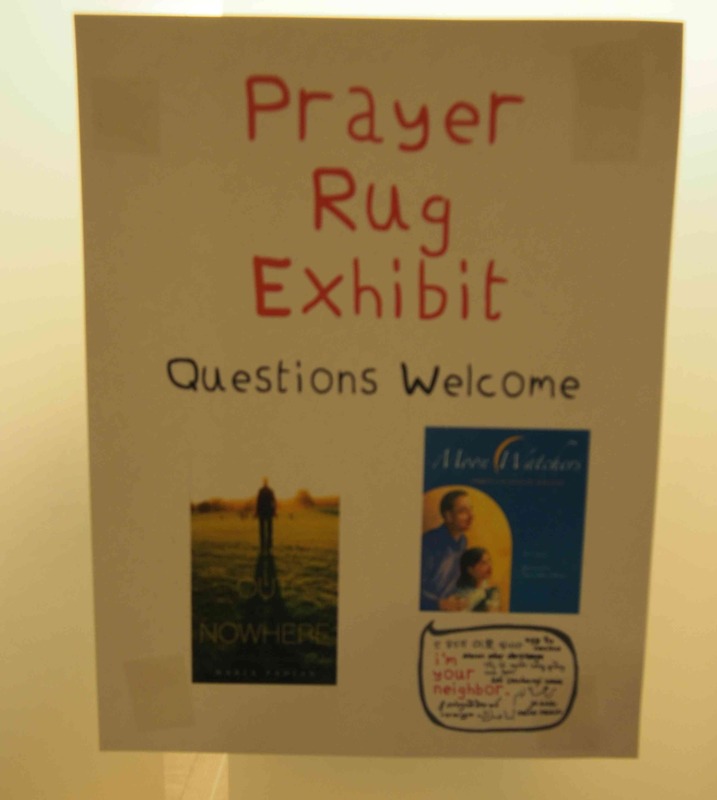 There was also a prayer rug room set up with a video of how to pray and prayer rugs loaned to us from our Muslim neighbors on display. Volunteers were on hand to answer any questions visitors had about the prayer rugs or Islamic practices. 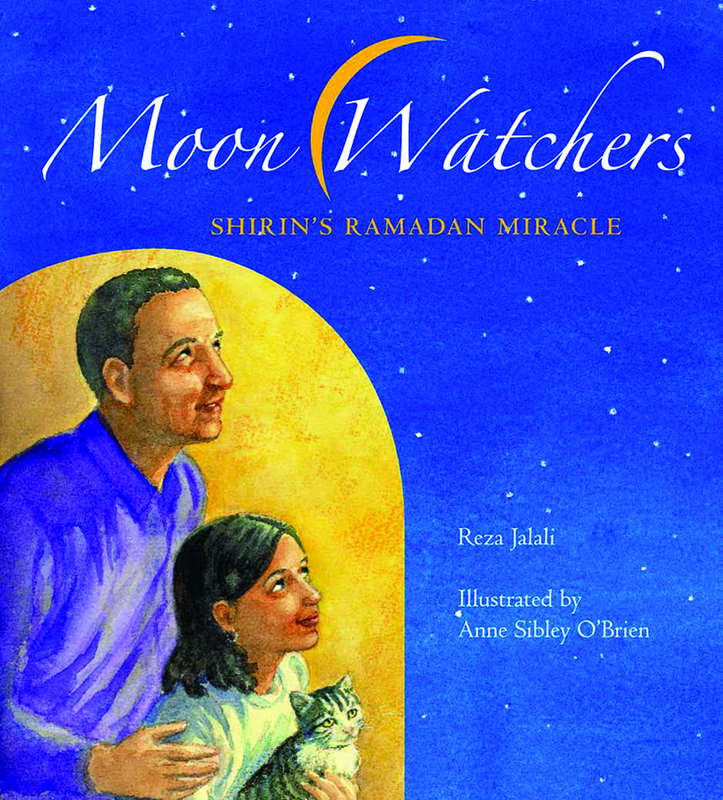 After introducing remarks were made by project director Kirsten Cappy, Reza Jalali, director of Multicultural Affairs at the University of Southern Maine and author of the children’s book Moon Watchers took the stage to talk about Ramadan and practicing the Islamic faith in Maine. He touched on his own experiences coming to Portland and the growth he has seen in the Muslim community in the almost thirty years he has made this city his home. 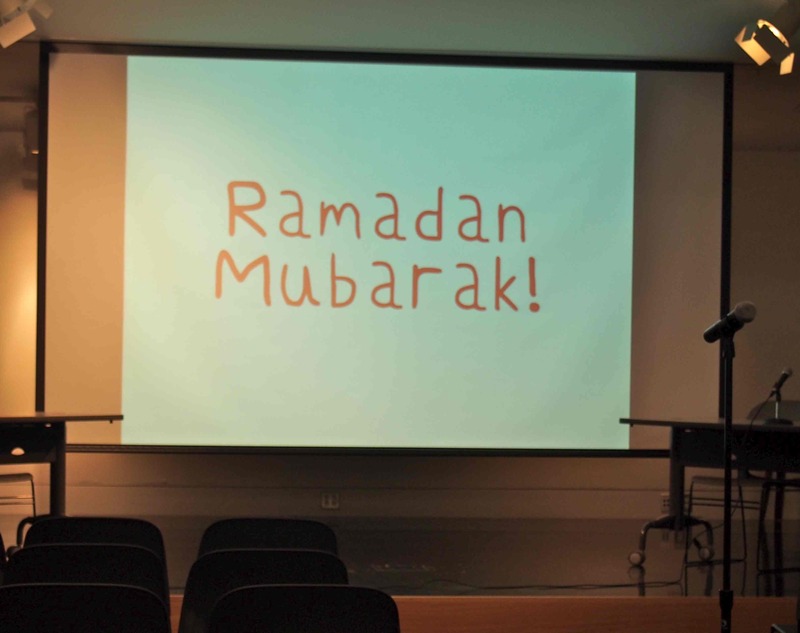 Jalali also spoke about the five pillars of Islam and the celebration of Ramadan as part of an “Islam 101” education for those in the audience who were unfamiliar with the practices. Attendees were given a chance to ask questions, some of which were answered from Muslim teenagers who were in the audience. 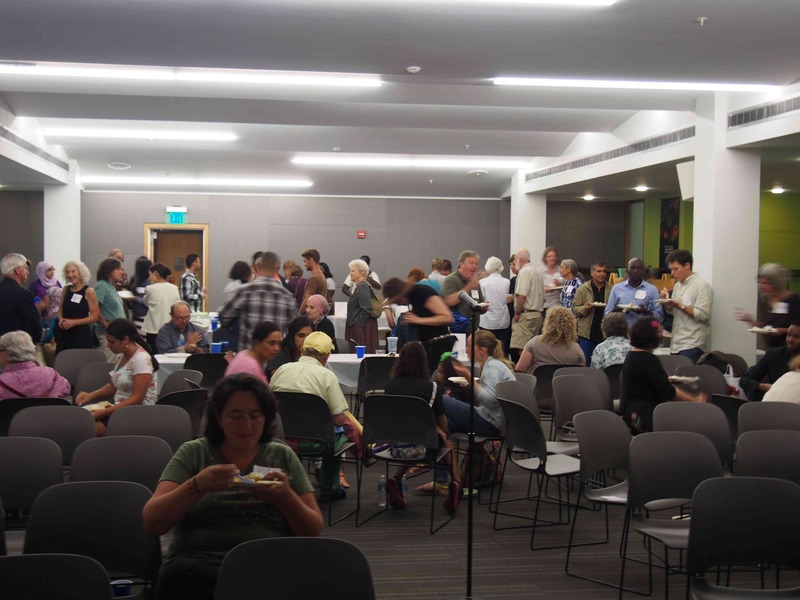 At 8:15, it was time to break the fast as a community. As Jalali described during his talk on Islamic practices, Muslims fast from sun rise until sunset during the month of Ramadan, as a time to practice self-discipline and to increase awareness of and compassion for the poor and hungry. A man from the Muslim community gave the call to prayer and signaled the time to break the fast. Hungry attendees of all faiths gathered to taste food from Tandoor Bread and Restaurant including Iraqi flat bread, hummus, falafel, lentil soup, white bean soup and mountains of rice perfumed with saffron, raisins and almonds. For a sweet end to the meal, there was rice pudding and baklava. Our thanks go to the many volunteers, Portland Public Library staff, Reza Jalali and Pious Ali, who dedicated their time and expertise to make this event a wonderful success. We also thank the family at Tandoor Bread and Restaurant for providing such excellent food to break the fast and which certainly was enjoyed by all who joined. The picture book A Path of Stars, set in Maine’s Cambodian community, will be celebrated at the Portland Public Library in Monument Square on Thursday, August 8, 2013 at 10:30 AM as part of the city-wide read entitled “I’m Your Neighbor, Portland.” All ages welcome, but best for families with children ages 7-12. Author and illustrator Anne Sibley O’Brien will read aloud from her book and lead a series of events including the drawing lesson of a lotus flower, teaching a Cambodian dance, and sharing Cambodian food from the Chiang Mai restaurant. 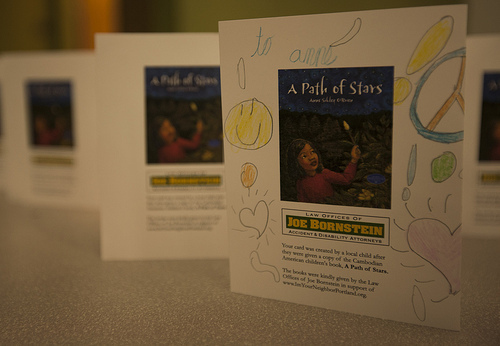 Children and families will decorate cards that will be sent to the Cambodian temple in Buxton, Maine. Free copies of the book will be given away (while supplies last) courtesy of the Law Offices of Joe Bornstein. The event is free of charge. For more information, contact Curious City at 207-420-1126. 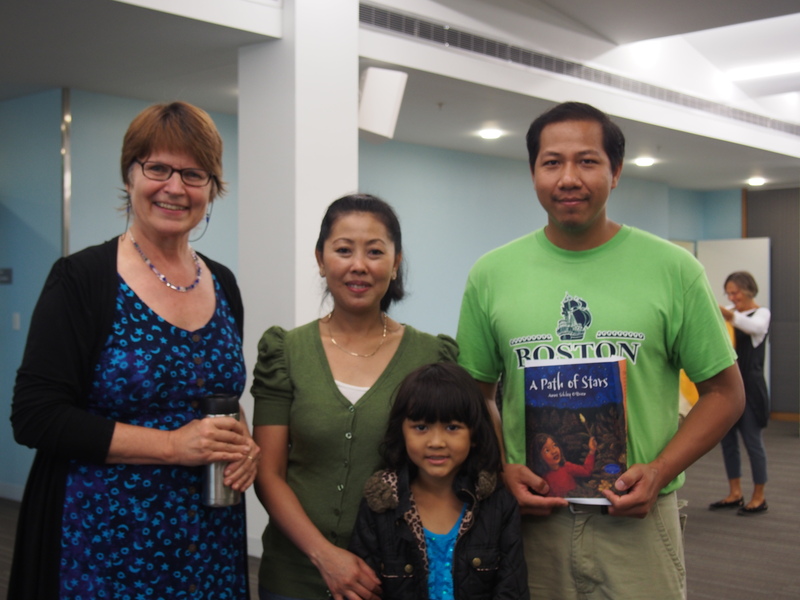 When author and illustrator Anne Sibley O’Brien received a commission from the Maine Humanities Council under the New Mainers Book Project to create a picture book about the Cambodian American experience, she knew that her own experiences and perspectives would be insufficient to tell an authentic story. However, she hoped that by listening and immersing herself in Cambodian culture a story might come through her. O’Brien read every book about Cambodia that she could find, and listened to the stories of her friends Peng and Veansa Kem, who grew up in Cambodia and escaped the war to come to the U.S. 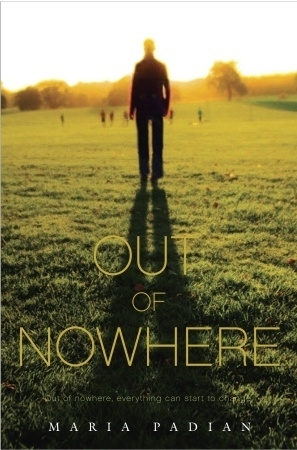 Filled with stories of beauty, trauma, loss and heroic survival, O’Brien waited. After many weeks, she had an image of a girl in a garden picking a tomato and a rose. From this image, a story began to take form and grew into her book A Path of Stars. 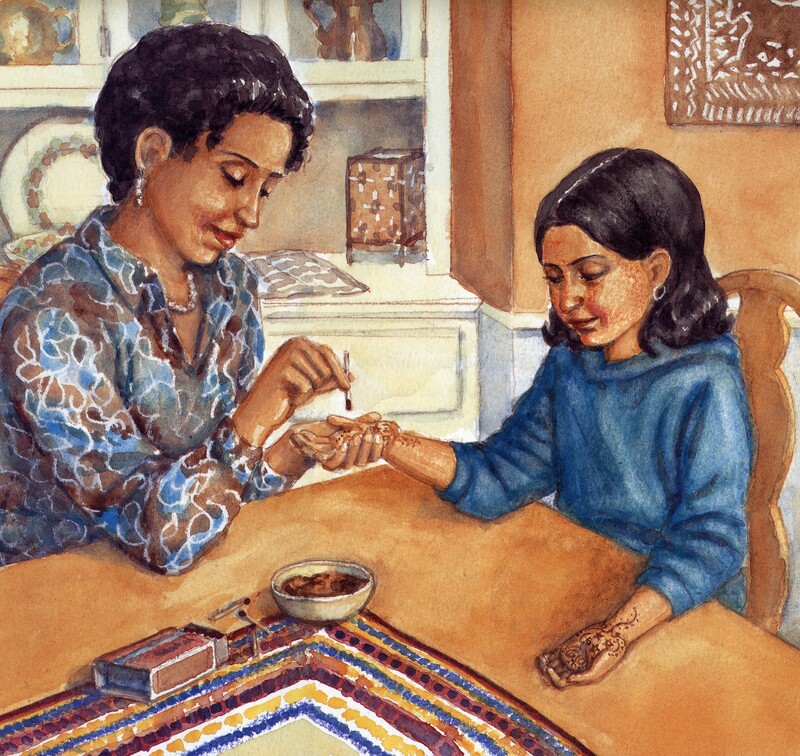 The children’s picture book tells an affecting story of family, loss, and memory. Dara loves the stories her grandmother, Lok Yeay, tells of the Cambodian countryside where she grew up—stories of family, food, and the stars above, glowing in the warm, sweet air. There are darker stories, too—stories of war and loss that Lok Yeay cannot put into words. Lok Yeay yearns to return to Cambodia to be with her brother. But when that dream becomes impossible, it’s up to Dara to bring Lok Yeay back to a place of happiness. 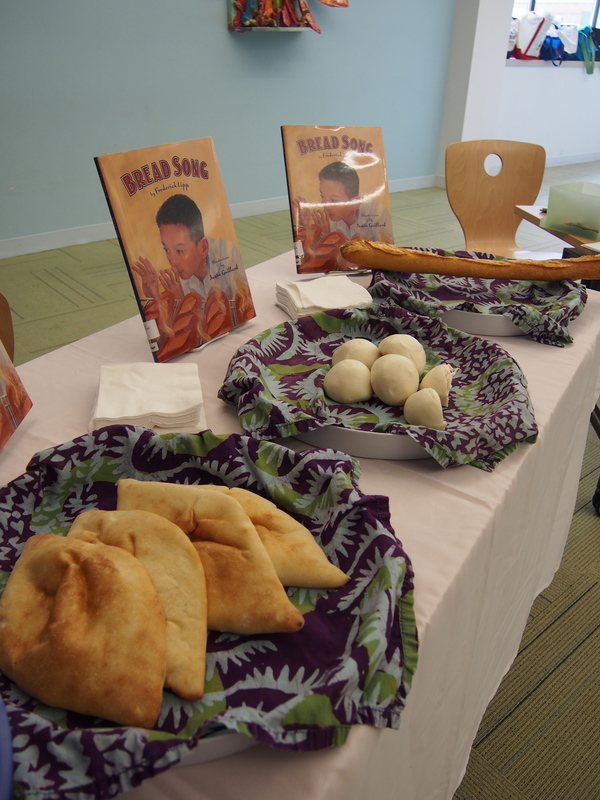 On July 24th, adults and children gathered at the Portland Public Library to celebrate Bread Song with a reading by the author and the tasting of bread from many cultures. 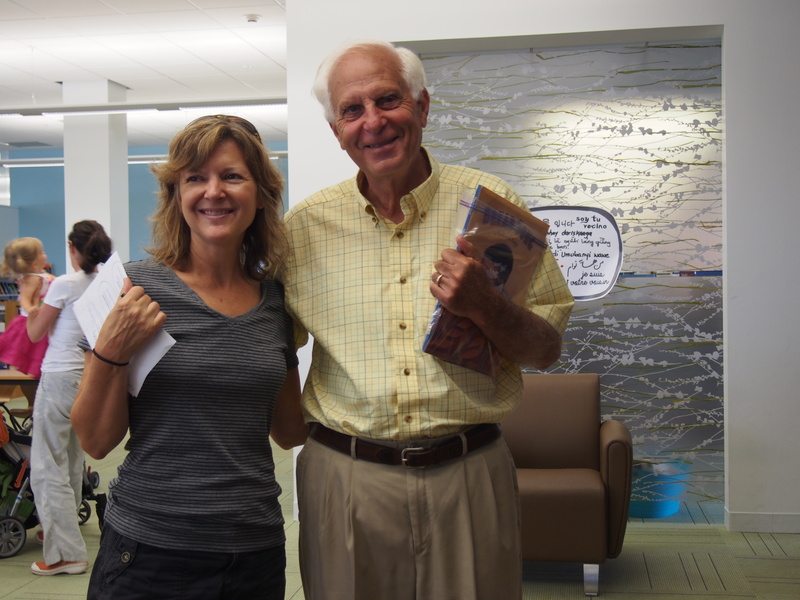 Author Fred Lipp, his wife Kitty and three grand-daughters were present. 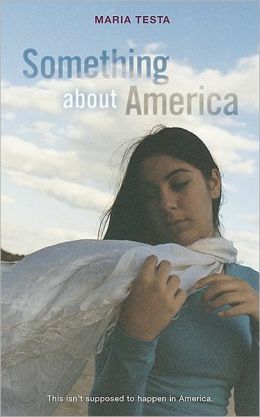 Alison Pray, the owner of Standard Baking Company and who sparked the “AHA” moment for Fred when he was writing this book, was also part of the audience. Lipp and Alison, owner of Standard Baking Co.
Lipp began with a discussion about new neighbors and overcoming shyness. He talked about the taking the initiative to talk to someone new because the other person might be too shy to talk to you first. During his time at minister at First Parish, he said he would often meet new people by simply walking the streets of Portland and striking up conversations. Lipp imagined it might be especially true for new arrivals coming from different countries to be shy about speaking in a new language. These thoughts were the inspiration behind the friendship between Alison the baker and young Chamnan in Bread Song. Lipp then read aloud from his book, acting out Chamnan walking across the street and counting the steps with his grandfather. His energetic reading engaged all members of the audience and kids followed along with copies of the book. After he finished, Lipp shared a secret with the audience. He explained that when he was younger, he too was quiet and rarely spoke because he had difficulty reading and stammered. He remembered what it was like to be shy and the importance of having a friend who reached out and helped him overcome his shyness. “A little bit of Chamnan is in me,” he said. Following Lipp’s reading, everyone was given a Bread Song matching activity, in which pictures of different kinds of bread had to be matched up with the bakery and country of origin. While it was easy to connect baguettes with Standard Baking and French origins because of the story, others were more tricky. Even some of the adults were stumped! Attendees were given the chance to sample three different breads from local bakeries all representing three different cultures. Iraqi samoons from Tandoor Bakery, Chinese red bean buns from Bubble Maineia and French baguettes from Standard Baking were available to taste. The red bean buns were most unfamiliar to many, although some had had similar pork filled buns at Chinese restaurants. The samoons were very popular, and several asked where they could find them for purchase. While they snacked on the breads, people could chat with Lipp and Alison about the book and her bakery. 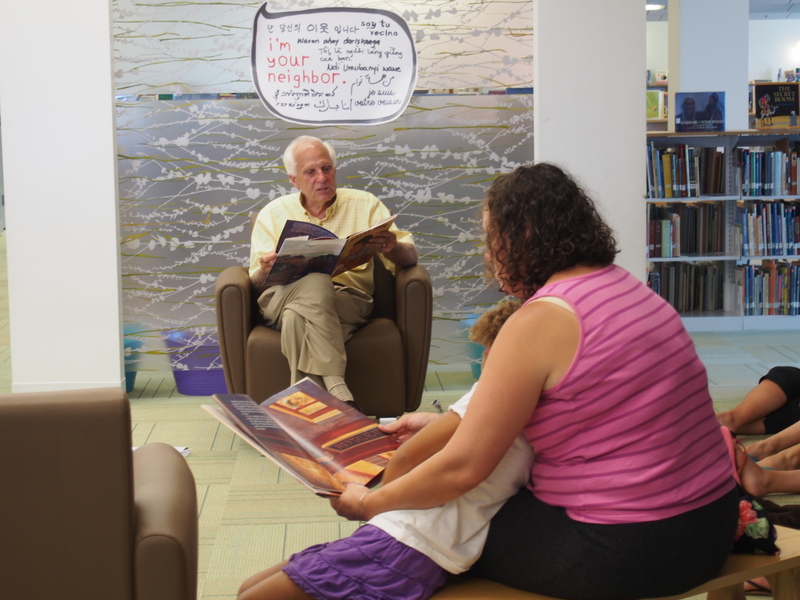 A former South Portland librarian said he was excited to share Bread Song with a Thai family member and her children. Lipp signed copies of his books and then said his good-byes as he and his family were off to lunch at a Thai restaurant to celebrate.